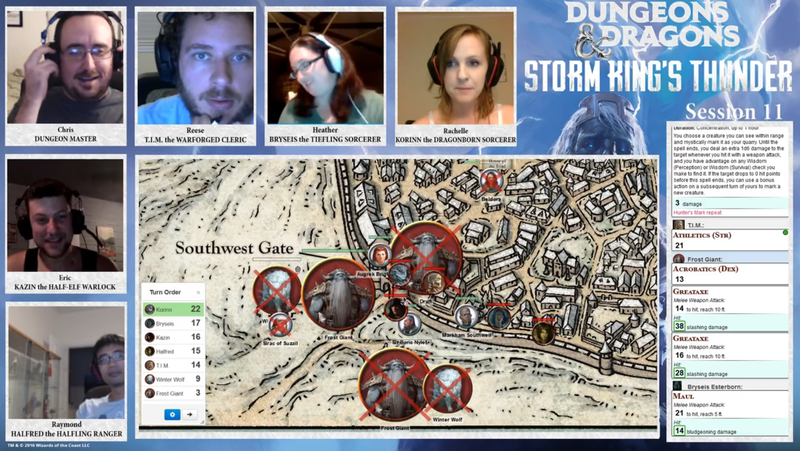 We defend the town of Bryn Shander and receive several shiny new quests. The front gate finally exploded, throwing shards of wood and metal fragments into the entrance of the town. The frost giant pulled his greataxe back and barreled inside. We were like annoying flies buzzing around him as he ignored our combined assaults. That would prove to be a fatal mistake. As the heavily injured giant charged forward I readied my psi-glaive in a hamstring maneuver to slow his assault. Sir Baric was quicker, bellowing a war cry as he brought his maul down on the giant’s foot, causing the mighty frost giant warlord to careen into the wall. He lurched forward and smashed his face into the ground. I could only stare as I saw T.I.M., having charged the giants outside the gates earlier in the fight, suddenly tumbling off the giant’s back. The frost giant siege of Bryn Shander is definitely one of the biggest, longest tabletop battles I’ve ever been a part of. It began halfway through last session and lasted half of this week’s session. As we eventually figured out, we only had to tackle the foes at the Southwest gate to save the town. Still, fighting a trio of frost giants at level 4 is a damn difficult fight, even with a bunch of NPCs. Most of them were completely worthless – save Sir Baric who was at least as good if not more than any one of us with his maul. The real ally was the DM. The giants never actually attacked us despite our repeated attacks and kills. They focused on the NPCs at first, then attacked the front gate. It was deliciously dramatic (and very Game of Thrones) that we managed to finally down their leader right when he broke through the gate. As soon as Drufi went down the remaining frost giant began to pull back, and shouted at the others surrounding the town. Without their warlord they thought better of their assault. We managed to down the last giant at the gate as he retreated and the rest fled. Huzzah! The spoils of war were terribly meager. The giants all have a goofy list of random trinkets from their various raids and attacks. Drufi did have a Luck Stone that Bryseis nabbed. I had Kazin visit Beldora who ended up recovering thanks to my quick reaction in rushing her to the temple healers. She gave us the next quest-line we needed for the coded book, to visit Thwip in Hundelstone. In fact we got quests from all the surviving NPCs. Sorry Sirac, no telling what you had for us thanks to T.I.M.’s rather odd way of handling that entire encounter. Sir Baric gave us some useful intel on the Weevil, the Zhentarim spymaster. The Zhentarim have been annoying enemies for us several times and we’ve now been drawn into a war with the underground criminal organization. Apparently the Weevil has last been seen in a place called Xantharl’s Keep, to the Southeast. Augrek, the friendly town guard, told us about a notable Giant Slayer named Dinayla had settled down in Goldenfields in the Southern region of the Dessarin Valley. 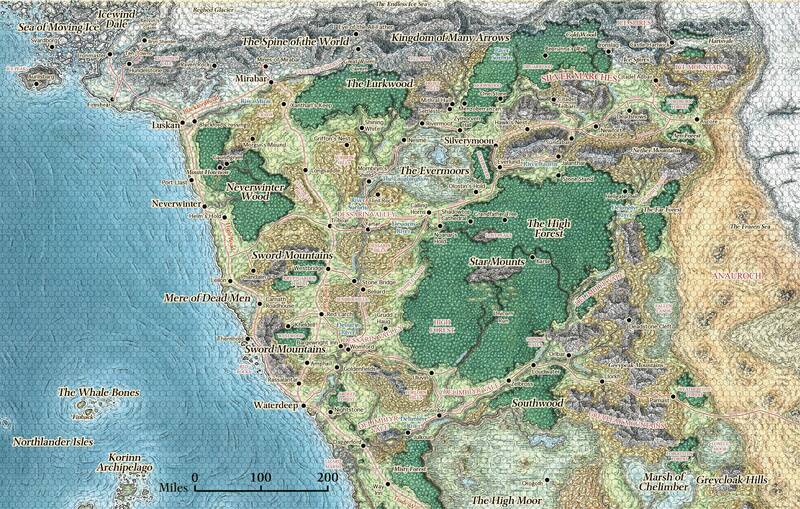 Hey that’s the region of our last campaign – and quite far from us now. Finally Sheriff Southwell gave us some side treks to tackle around the Ten Towns region, which were far closer. Some missing people around Lonelywood and something about ice eating people in Caer-Dineval. Helping out the people of Ten Towns came with a juicy 200gp reward and an official title as Defenders of Ten Towns. We had a bit of time left in the session so after resting up we journeyed North toward Lonelywood. The trip was uneventful and we could make it there in a single day, passing through a few other small ice fishing villages. Lonelywood was very small and we gravitated toward the only inn. This was a great scenario where we felt like FBI agents barging into a mysterious small town full of suspicious locals. We learned about a crazy old man who often disappeared in the neighboring woods, and his two sons. One of the sons’ girlfriends also recently went missing, as did a local hunter. We grilled the innkeeper, then the sons showed up. The younger son (the boyfriend) told us about how he and her were camping in the woods, and that he woke up to find her missing. I was suspicious and used rolled for Insight, but it was Bryseis that sniffed out the lie. The sons decided to privately confer with one another, and Korinn used Invisibility to spy on their conversation. Turns out they were definitely lying and knew exactly what was going on. In fact it sounded like they kidnapped the girlfriend for their father, though we don’t yet know why. They were willing to lead us out there but wanted to wait until morning. We didn’t want to give them any time to prepare and demanded to go out now. We waved off Korinn’s disappearance so she could stay invisible as our ace in the hole. We had a lot of fun with this little exchange, and it was fun to also feel like we’re finally doing things on our own rather than just being pulled along a linear path. Oh, and thanks to that massive battle at Bryn Shander we earned enough experience to level up. We’ll begin next session with level 5 and an evening stroll in the woods.